How to help clients understand they get what they pay for, in the long run. I am a moderator at the Social Media Examiner Small Business Club and in that group people ask about how web consultants price their services. This question is asked over and over at different times. It’s no surprise that it came up again recently. 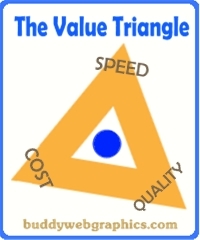 Kristy C. Cartier, a valued member at the SME-SMSB Club posted a thread that featured “the Value Triangle” and although I’d seen one similar this one really hit home. 1 – Speed – Get it done by uh, tomorrow! 2 – Quality – The best you have to offer! 3 – Cost – At the same price! 1 – Speed and Quality = more cost. 2 – Speed and Cost = less quality. 3 – Cost and Quality = more time. Can it be all three? Actually, yes, but the client must understand the added cost to be able to justify that in their own budgets. It’s a good idea to include these factors in any written agreement also along with an image to show them how the balancing act works. Even unreasonable people (clients) can understand this simple concept. At least we can hope for this concept to sink in so they can always be aware when they ask for more.